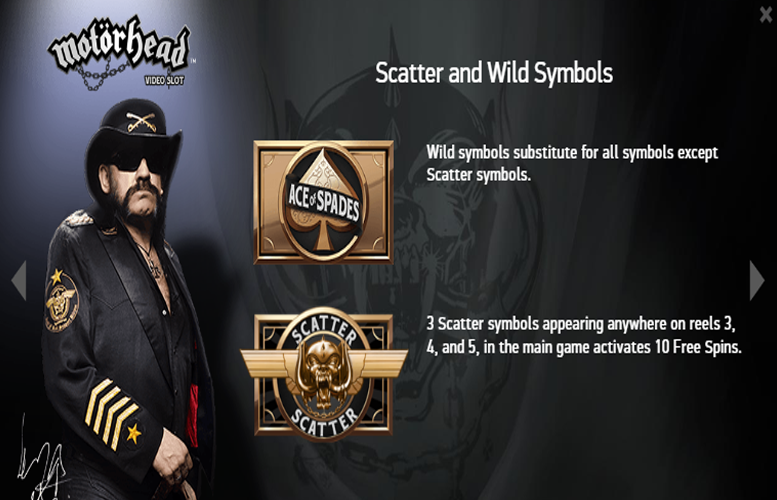 The Motorhead slot machine from Netent is a fitting homage to one of rock and rolls most infamous bands. It starts with live footage of Lemmy’s troupe rocking out to the suitably gambling-themed “Ace of Spades” before taking the player centre of the crowd in front of a loaded stage. If you like it loud, this one’s certainly for you. In terms of specifics, the title is played on an innovative game board. 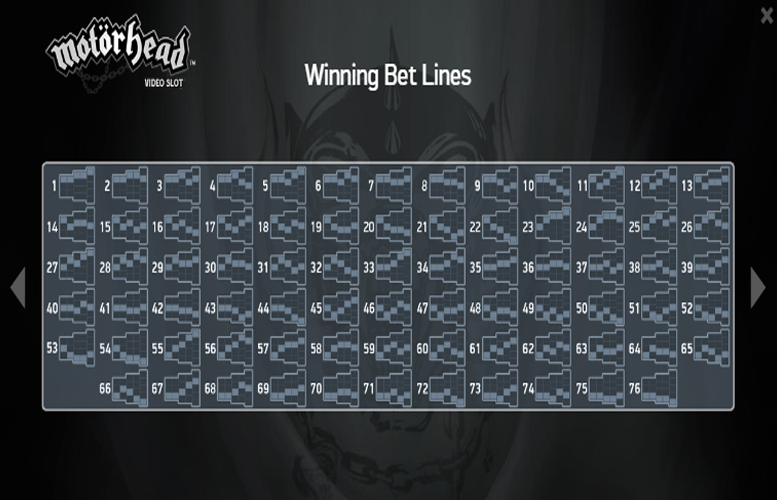 It features 76 win lines that are used across grid that comprises of five reels and is split into three, four, and five rows. This make for a much more varied experience than is standard on modern slots utilising the five by three grid. There are also some great features and a massive rtp rating on the game. Let’s take a close look. Great imagery and design. Playing this slot is almost like being front of stage at real Motorhead show! Innovative game layout. We love slots that do away with the standard rectangular grid format. Rock mode! You can listen to the music of Motorhead whilst spinning away. What’s not to like about that! Enormous return-to-player rating. 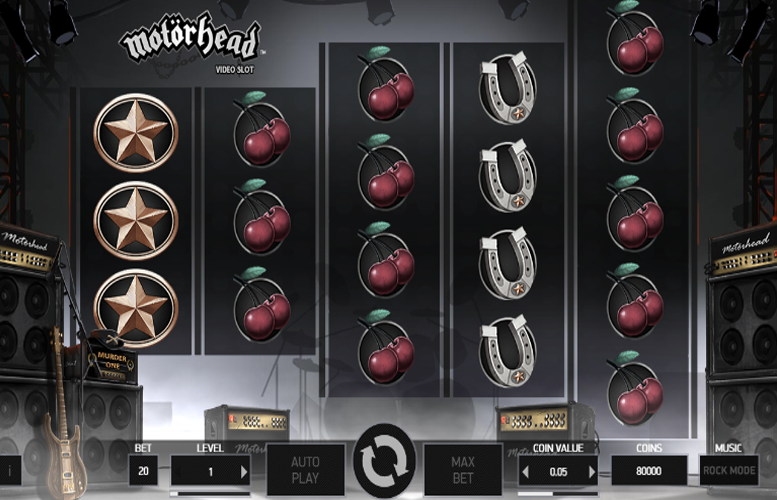 This makes the Motorhead slot ideal for spinning through a bonus on. Low main game prizes. Unfortunately, Motorhead isn’t about hitting massive wins during the base game. Lemmy = 150x the line bet. Star = 50x the line bet. Bell = 30x the line bet. Lucky Seven = 30x the line bet. On every spin in the main game and free spins, unless the Bomber feature is active, one or more reels will be Mystery Reels. After the reels have stopped, if there are mystery symbols on the reels, they will transform into a random symbol (excluding “scatters”). A Mystery Reel is a reel that consists of a stacked reel of mystery symbols and regular symbols. The Bomber Feature can be activated randomly before a spin in the main game only. Each bomb consists of a cluster of mystery symbols. A number of bombs occur on the reels and then create at least 10 overlay mystery symbols. Once each bomb has generated the mystery overlay symbols, the reels spin with a symbol being chosen in the same way as the Mystery Reel Feature. 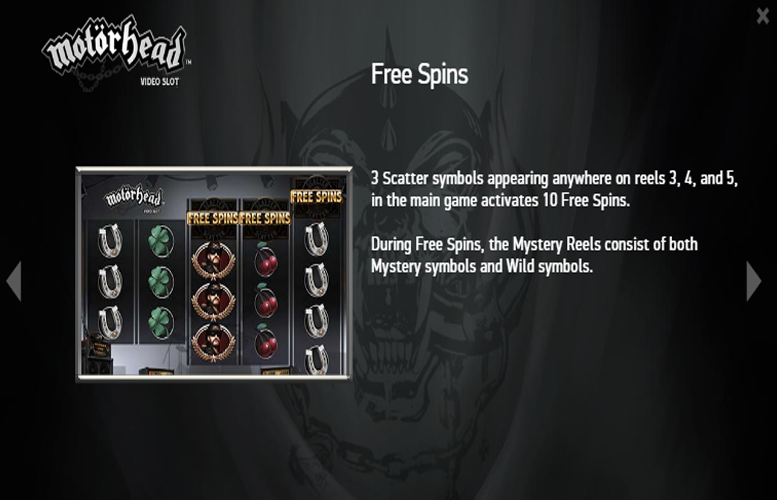 Three “scatter” symbols appearing anywhere on reels three, four, and five during the main game activates 10 free spins. During these, the Mystery Reels consist of both Mystery symbols and “wild” symbols. Horseshoe, Cherries, or Clover = 12x the line bet. 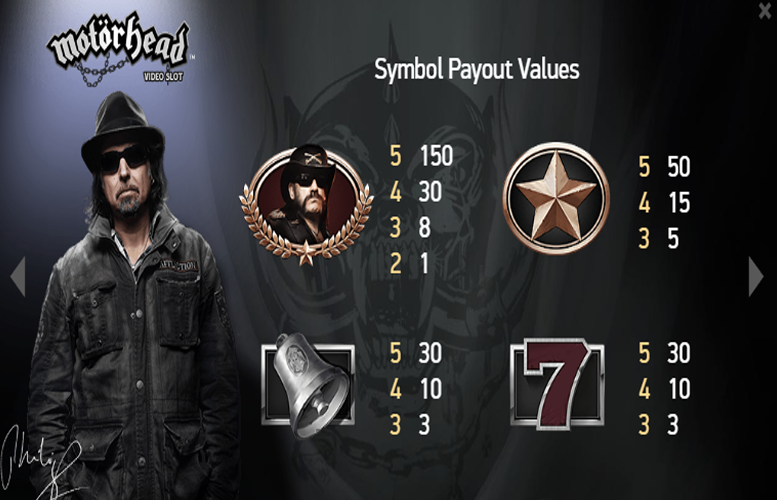 As is common on Netent titles, the number of win lines is fixed at 20 on the Motorhead slot machine. This means that players are only able to adjust the coin value and the number of them bet on every spin. The maximum and minimum coin values are £1 and 1p respectively. Players can bet between one and ten of these on each of the lines. Therefore, with all values maxed out, the highest possible bet per spin is £200. Meanwhile, with everything set to its minimum, the lowest cost per spin is just 20p. Whilst these limits are unlikely to excite the very highest rollers around, most players should find them more than accommodating. As fans of all things rock and roll, it would have been difficult for Netent to offend us with this machine. From the cinematic opening of Motorhead’s live show to the “rock mode” that allows players to listen to the legendary group’s best tunes, it really is a cracker. It’s not just about the soundtrack, however. There are some great game features and the innovative grid design keeps the action varied. Unfortunately, the slot does suffer when it comes to its prizes. They’re far from the biggest in the industry. This might limit the enjoyment that punters who are used to playing top-heavy machines can glean from the title. This game has a rating of 4 / 5 with 511 total reviews by the users.